Janet Knight, Artist. Art Is Life and Life Is Love. 10 Questions with Janet Knight. Art is Life and Life is Love. G'day, avid reader of internet ramblings! Frankie here again. I absolutely love being able to interview amazing artists in order to provide you, dear reader, with a bit of an insight into their stories. Janet is an amazingly passionate, positive and open artist who is the epitome of someone living her love, and loving her life. We can all take a leaf out of her book :) Enjoy this upbeat beginning to your 2017. Q: Your figures, particularly when painted on linen, are simply spectacular. Such great light, movement and life. A minimal approach with maximum ka-pow factor. Do you have a tutorial to achieve a similar effect? If you follow my Facebook page you will know that one of my loves is painting portraiture and the figure. I use Belgian Linen to work on with a lot of my pieces. Its natural fibre allows me to create soft images using washes for a natural depth and emotion. I hold special workshops teaching this technique and I will also be teaching this process online via my web page . 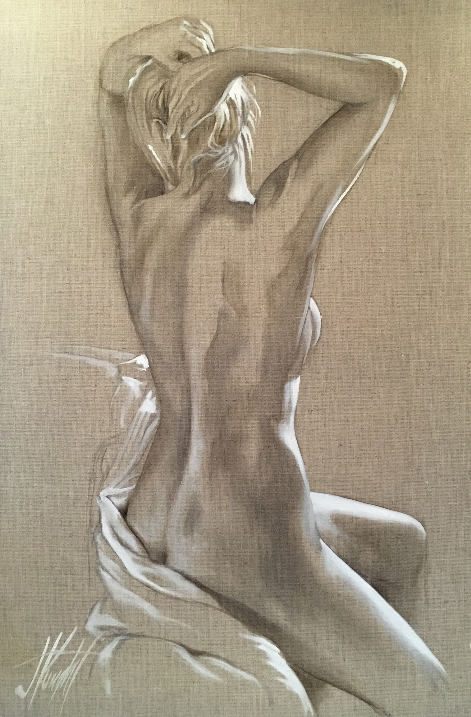 When working with linen I find that the natural element of the fibre allows me to flow with natural tonal colour values and limited palette allowing me to express feelings and emotions directly to the surface using dramatic lighting as a powerful added stimulant. 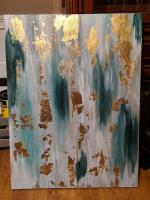 Q: You work with a variety of different painting mediums to create your art. Do you have a favourite, and if so, which and why? What sets me apart is the diversity in my expertise as an accomplished, award winning artist in watercolors, pastels, acrylics and oils. Over my career one of my goals was to conquer each medium, learn through trial and error and then put my own spin on it! Then I found myself teaching others a few techniques I picked up along the way!! I am happy to say that I have done this and I now teach classes and run workshops in all of the mediums!! They are a great portrait medium. Q: What do you know now that you didn't know five years ago? What a great question! Throughout my career as an artist there was a time when I just painted! It's a true connection coming from the heart area. It's a feeling, a wanting, a drive!! It's exceptional, it's overwhelming and its magical! Q: Do you enjoy painting landscapes or figures best? 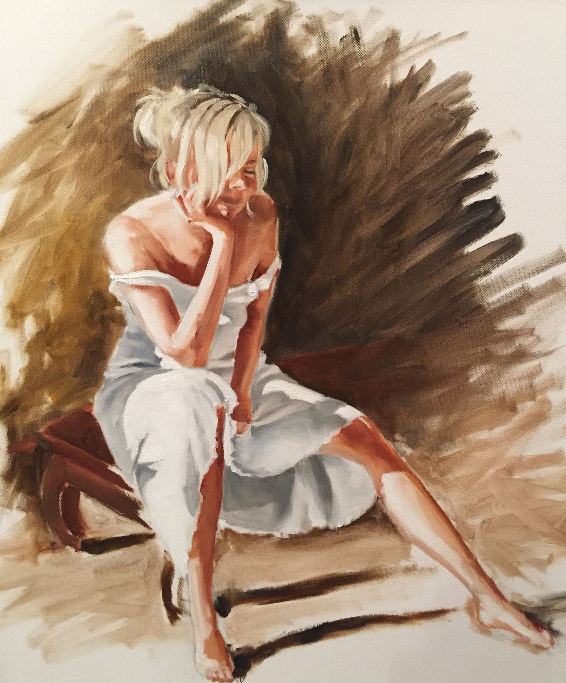 During my career I have painted many subjects, landscapes which I love due to my beautiful country Australia, figurative my new love which provides me with much emotion! Passion and life! And varied other subjects including animal portraiture and horses! The one that stands out above all right now is my figurative work, the figure is an amazing thing!! So beautiful, so natural, it's earthiness, proportion, tonal values, muscle formation teaches us many many things!! We could paint forever and never learn every element and that is what makes it so exciting to study! Q: Coming from a design background, do you find yourself using the principles you learned back then very much now in setting out your paintings? University days taught me discipline, precision and deadlines. My graphic design course taught me all aspects of composition including perspective, depth of field and very precise rendering techniques. My university days did not involve computers, so the art was entirely created by hand. Fundamentals and the importance of freehand drawing to create a personal portfolio was priority. There were no apps, no Google, no Pinterest!! lol. We did things as we only knew how! Time consuming yes! But in the process a deep concentration teaches basics to the core - and stays there - and is still the reason today why I am so passionate about the fundamentals of creating good art! 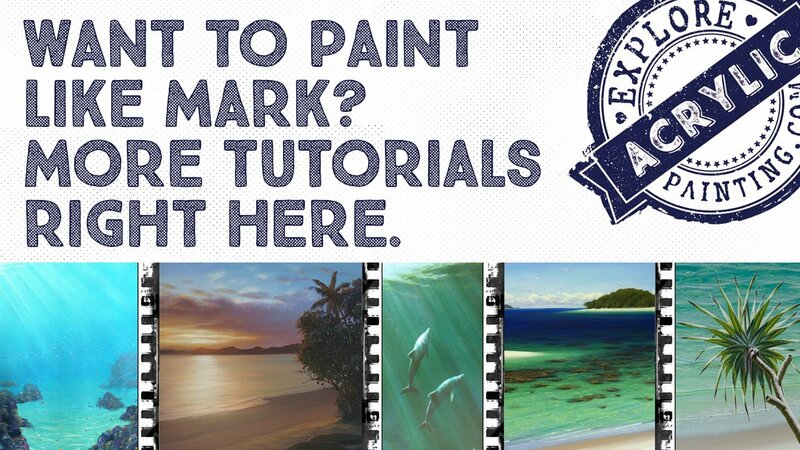 Q: You have a beautiful online course to paint Australian Iris’ - are you planning on adding any more online tutorials? My online E course that is available right now from my web page is only the beginning! I have a brand new web page where I will continue to supply to interested artists a variety of different instructional tutorials, including impressionist techniques with florals, figurative work on linen, landscape building techniques and plein air landscape. I will also have a Youtube channel where I will show parts of my tutorials so that interested students can see a glimpse of the course before purchasing. Q: What is the most wonderful thing that has happened to you as a result of your teaching or arts practise? One of the most wonderful things for me as an artist with a long career is the people I have met over the years, emerging artists, established artists, art buyers, students, galleries, workshops and the list goes on. I am quite the people person, and I just love interacting with wonderful arty souls! Not sure what it is about them, I only know that we are kindred spirits and I feel warm and fuzzy in their presence! Ha! It's quite a unique family, sharing similar loves, creating individual views on life and learning from one another! Another wonderful experience in my career is the opportunity to be featured on National TV Colour In Your Life - a program featuring artists and their techniques. What a wonderful experience it was for me, I featured on the program twice and I had an amazing time! 2013 and 2015. These programs are now international, reaching many countries including America, New Zealand and Europe. My Colour In Your Life program airs in California this January 2017. How exciting!! Q: What painting mediums or additives can you not live without? I remember our trip to Europe, I made it perfectly clear to Hubby that I could not possibly travel for five weeks without painting!! My painting and my artwork is so imbedded into my life that it would be as if I would have to stop breathing! I was almost panicked!! Subsequently a tour of Europe - 10 pastel paintings later! I was happy!! This is what my art means to me! When it comes to mediums and additives I think if you are versatile and active in your creations you can substitute additives and experiment with mediums rather than relying on one in particular although I do like turpentine for washes in my soft oil paintings. I have also substituted with watered down acrylics for washes due to the toxicity of the chemicals (in oils). Q: What are the the top five things you like to do besides painting! One of my next loves is my garden, I feel that getting close to nature teaches me just as much as standing behind my easel. The smell of the soil, the scent in the air, watching something grow from your nurturing It's such a beautiful feeling, it not only teaches you about the life of plants, it teaches you about life itself! I surround myself with beauty and a beautiful garden helps me to create. Number three of my favourite loves is my beautiful sidekicks Allie and Jarrah, my standard poodles. They spend all week with me in my studio, greet students as they arrive and they have also been spoiled with treats from a few of them! I also always enjoy my walk with them on Sundays, 10km around Melbourne's beautiful botanical gardens or St Kilda Beach. I couldn't be without them they are such a huge part of my life. I also enjoy very much networking on social media, galleries, answering questions from beginner artists and general sharing of artwork. I have found this very beneficial in my career. Social media is a great way to display your art to the world, I have been asked to exhibit in exhibitions and run workshops overseas and this last year acquired four gallery representations through social media. These days I have more students and models find me through these avenues. My grandchildren are a huge love of mine, they interact with me in the studio, we paint together and I know they will have paint run through their veins because they are living it. We will wait and see, they are only quite small right now but they have been exposed to so much creativity I can only hope that it stirs a fire in them. Q: Tell us something no one else knows about you! Over the last two and a half years I have been writing. Before this I couldn't write to save myself! It approached me like an awakening! It is connected so deeply with my art and my feelings on life and love - when the urge arises I must write!! Such a strange transition and connection and this also drives me to touch others through my words! My words are soft and positive, there is no aggression or negativity, they flow like a river and people like what I have to say! It's very special for me to do this and I have commented a couple of times that I hope I never wake up tomorrow and the magic is gone!! I only know that my art and my writing come from the same place and its deep! A great connection, with meaning and heart and the result is love! I truly love and have passion for my career which is evident in every aspect of my life. I own, operate and teach in my established Melbourne based art class / studio. I am a professional artist whose works have been acquired by international and Australian collectors. I have painted for over 25 years, as I graduated from Ballarat University with a Diploma of Art, the Aussie equivalent of a Degree. My current works are a testament to my ever evolving passion for my art. 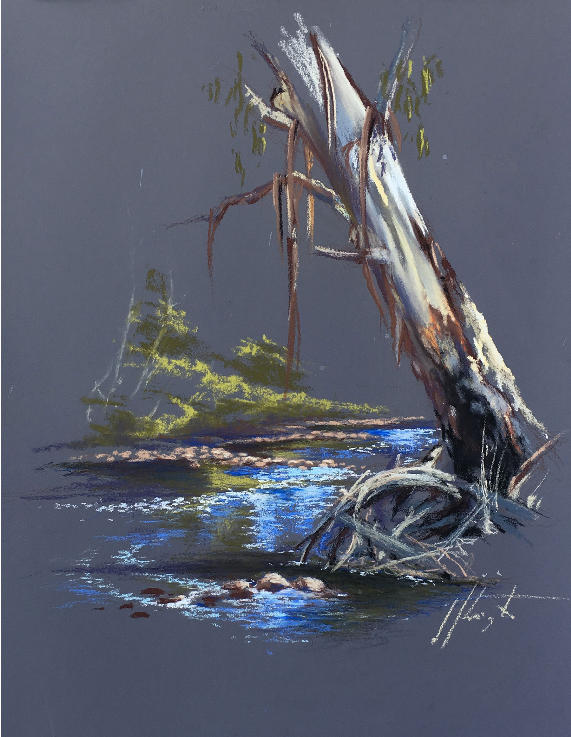 I am a well recognized Australian landscape artist, and a television personality with guest appearances on “Colour in Your Life” and I combine my connection with nature and the environment with my unique personal skills and interpretation which often ends with a surreal twist in my artworks. 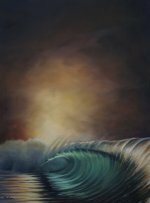 What sets me apart is the diversity in my expertise as an accomplished, award winning artist in watercolors, pastels, acrylics and oils. My exhibition schedule is quite busy with solo and shared exhibitions throughout the year and I love participating in community focused exhibitions. 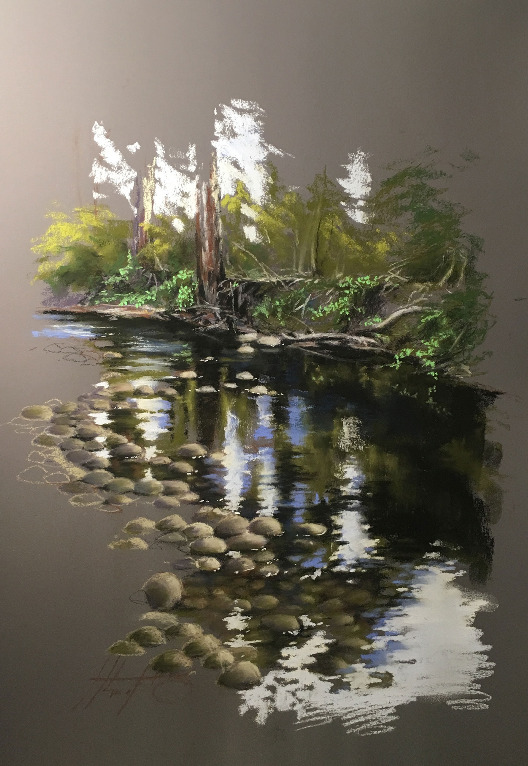 Having taught art classes full time for over 18 years from my studio, teaching the most inexperienced “newbie” who may have never held a brush, to the intermediate artist seeking to further refine techniques and learn new methods, near daily art classes and workshops keep me on my toes throughout the week. My family members in residence during my classes often add their own comment or two through a bark or a yelp, and sometimes if really lucky, a distant squawk from the chickens! In addition, I enjoy a steady flow of private commission work as well as working on artwork for my private collection and pieces for specific charities. I always have an enthusiastic “yes” to invitations to be a guest guest speaker at local educational institutions, inspiring the exploration of creative skills in young people which is within all of us at any age.